Ripley's Believe It or Not! 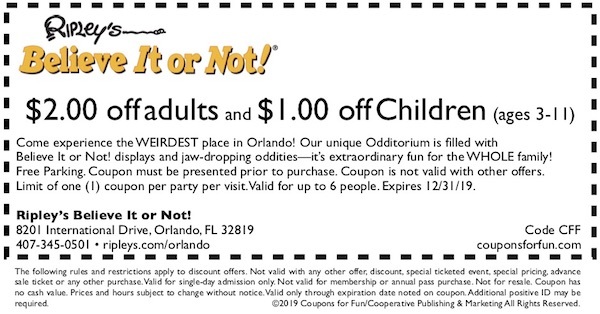 Odditorium - Orlando, FL - Get savings coupon! Come experience the WEIRDEST place in Orlando! Ripley’s Believe It or Not! Odditorium is one amazingly unique attraction. Our 10,000 sq ft location actually looks like it’s falling into a sinkhole! Filled to the walls with Believe It or Not displays and jaw-dropping oddities— it’s extraordinary FUN for the WHOLE FAMILY! Take the self-guided tour at your own pace and enjoy this unusual, eclectic collection from the amazing world of Robert Ripley.